GHOST TOWN Benefit for The Venice Family Clinic at L&M Arts Tomorrow! - Yo! Venice! Home Abbot Kinney Blvd GHOST TOWN Benefit for The Venice Family Clinic at L&M Arts Tomorrow! GHOST TOWN Benefit for The Venice Family Clinic at L&M Arts Tomorrow! 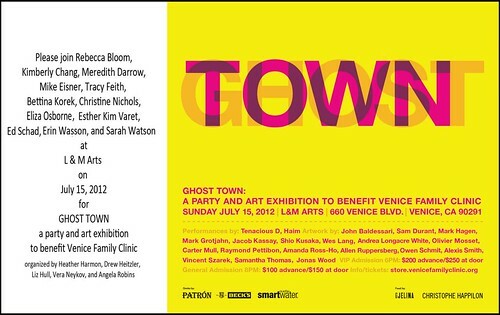 GHOST TOWN will host its inaugural benefit for The Venice Family Clinic at L&M Arts on Sunday, July 15th. Offering a fresh take on the traditional benefit, GHOST TOWN welcomes art patrons and beach-goers alike to enjoy an evening of culture and live musical entertainment by Tenacious D and Haim, as well as refreshments provided by Gjelina, oyster gourmet Christophe Happillon and other local Venice establishments. Named for the area of Venice where L&M Arts is located, GHOST TOWN is an art exhibition embracing the unique culture of Venice Beach. The artwork presented for sale has been generously donated by artists who live and work in Venice or have a strong affinity for the community. Participating artists include: John Baldessari, Sam Durant, Mark Hagen, Mark Grotjahn, Jacob Kassay, Shio Kusaka, Wes Lang, Andrea Longacre White, Olivier Mosset, Carter Mull, Raymond Pettibon, Amanda Ross-Ho, Allen Ruppersberg, Owen Schmit, Alexis Smith, Vincent Szarek, Samantha Thomas, Jonas Wood. Thanks to Rebecca Bloom, Kimberly Chang, Meredith Darrow, Mike Eisner, Tracy Feith, Bettina Korek, Christine Nichols, Eliza Osborne, Esther Kim Varet, Ed Schad, Erin Wasson, Sarah Watson, Heather Harmon, Drew Heitzler, Liz Hull, Angela Robins and Vera Neykov for making this event happen!